Welcome to the Hebron Public Schools Food Services. In partnership with our families, through our Food Services we help students succeed by creating a healthy and happy eating environment for active and growing learners. We prepare nutritious, safe and appealing meals in a positive style that promotes a healthy and balanced diet, while also maintaining financial soundness. The Hebron Food Service offers a choice of healthy meals each school day. 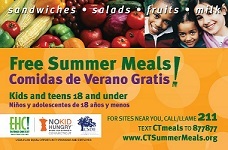 All meals served must meet all State of Connecticut and USDA nutrition standards. We look forward to providing lunch for your family.